Since she posted the pic her Instagram account was hacked. She can now be found at @mindofkye_ . It’s fantastic that 18-year-old Kyemah McEntyre, from East Orange, NJ, became an overnight sensation after posting the above photo on her Instagram page. 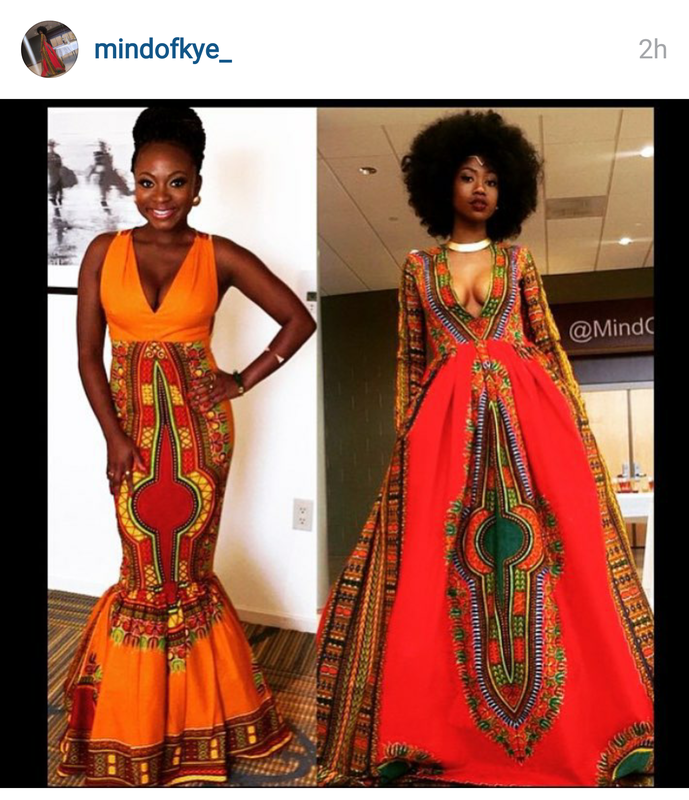 She lit the internet on fire with her African inspired prom dress. The bold pattern, full skirt and interesting design was enough to make everyone forget about that oh-so-deep plunging neckline on a high school girl. 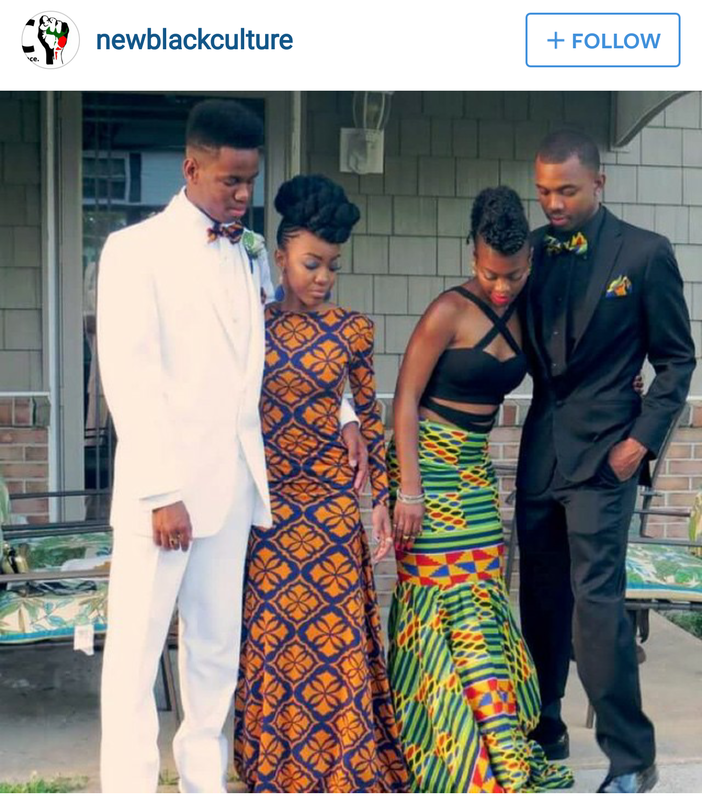 This isn’t the first time a young woman wore an African printed dress to the prom. Just type “African prom dress” into Google and you’ll find there are plenty that pop up. 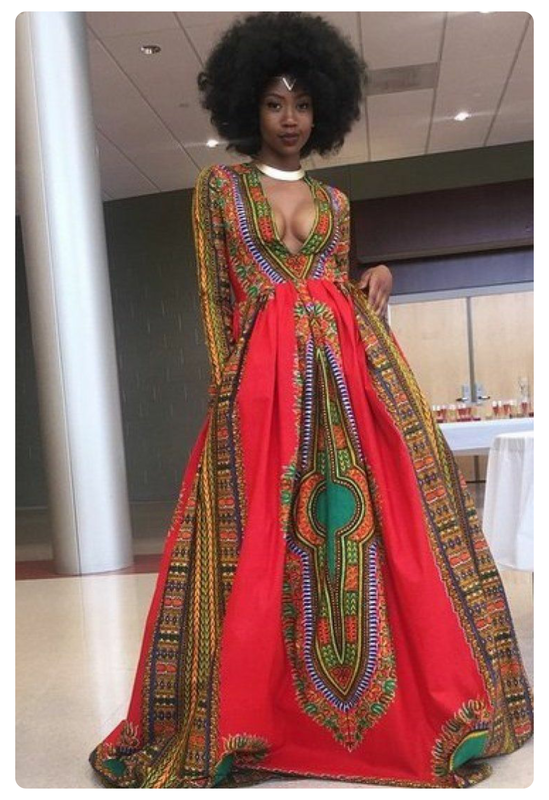 The same week her dress made headlines there was an image of a group of other students posted on Instagram too, who also chose to wear African printed dresses to their prom. Four students going to the prom. Image from @newblackculture on Instagram. What makes McEntyre’s story so interesting is that she, like many others, is a bullied teen. She captioned the original post on twitter with, “This is for always being labeled as “ugly” or “angry”. Thank God, stereotypes are just opinions.” Her new-found fame as a designer not only catapulted her into a media darling, but it’s sure to have been the best revenge to all those who said negative and hurtful things to her in the past. Hot off the heels of her now infamous prom dress, McEntyre was commissioned to design a gown for singer Naturi Naughton, who used to be a member of the R&B group 3LW. She rocked that dress on the Red Carpet at the 2015 BET Awards. Once again, Miss McEntyre was in the headlines as a young designer with a bright future. 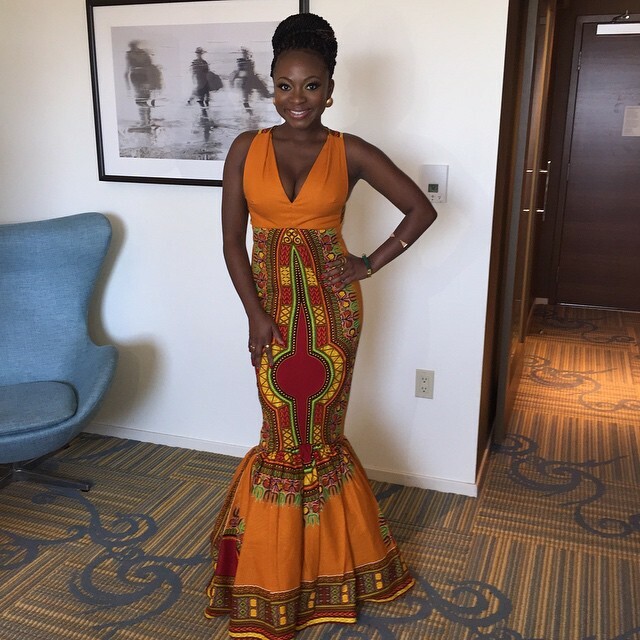 Naturi Naughton in Kyemah McEntyre Gown before stepping out on the red carpet at 2015 BET Awards. Over the last few years African fashion and prints have become more mainstream. We often see magazines with fashion spreads featuring clothing and accessories often labelled as ‘tribal’ or ‘exotic’ in editorials. The Telegraph UK called the pattern in Kyemah McEntyre’s dress ‘a striking tribal print’. With so many designers choosing to use inspiration from the continent, it has also led to increased exposure for African designers who have been trying to break down doors outside of their own countries. African fashion is going global. 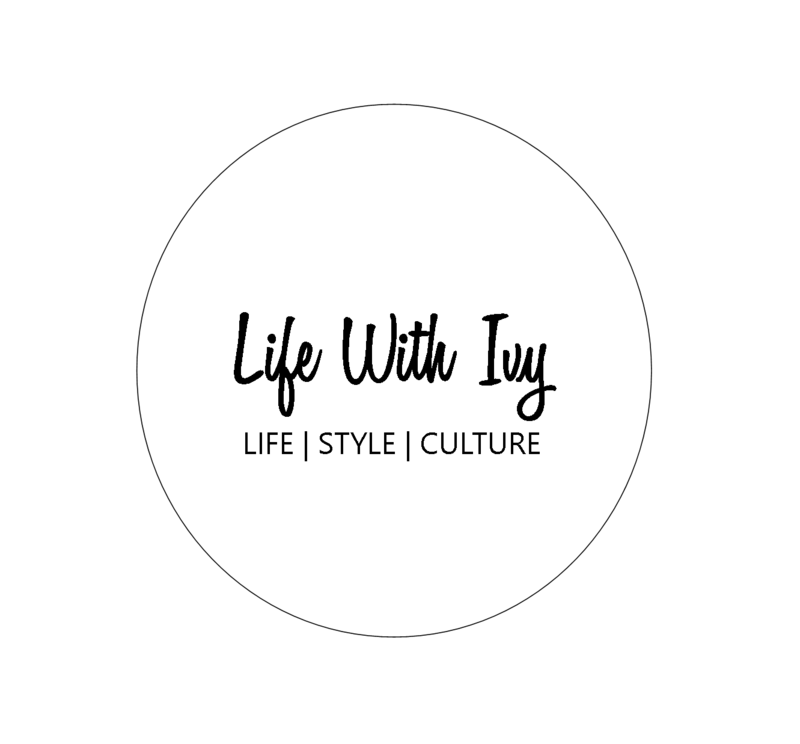 Everywhere around the world African Fashion Week is popping up making itself known including Africa Fashion Week NY, Toronto, LA, Berlin, London, Montreal and many more. McEntyre’s dress going viral is proof of how much the public is not only craving but truly loving the look and feel of African style. Image from @mindofkye_ on Instagram. Now let’s talk about that fabric. Did you happen to notice the similarity in the pattern used in both dresses designed by McEntyre? The bold rich pattern is not new. In fact, it’s a classic design from the 1960s which is actually a take on the dashiki. Some people even call this a ‘dashiki’ print. 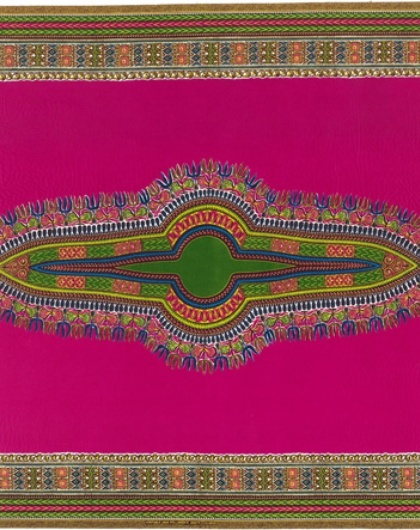 It’s also been said that its historical references come from an old motif from the church; a Coptic Altar cloth. However, it’s commonly known as the ‘Angelina’ in the African community. It gained notoriety during the 1970s and was nicknamed ‘Angelina’ by Ghanaians. It got its name because the fabric was widely popular at the same time as the hit song ‘Angelina’ by legendary highlife band Sweet Talks. Since then, this fabric has been like any other fashion item. It comes and goes with new trends every few years. It excites me when I see how the vibrant patterns of African culture are being embraced more every year. I applaud McEntyre for choosing to use these fabrics in her work. She said that she wants to bring African fabric into the spotlight, she certainly has done that. Hopefully this is not just a one-time thing. 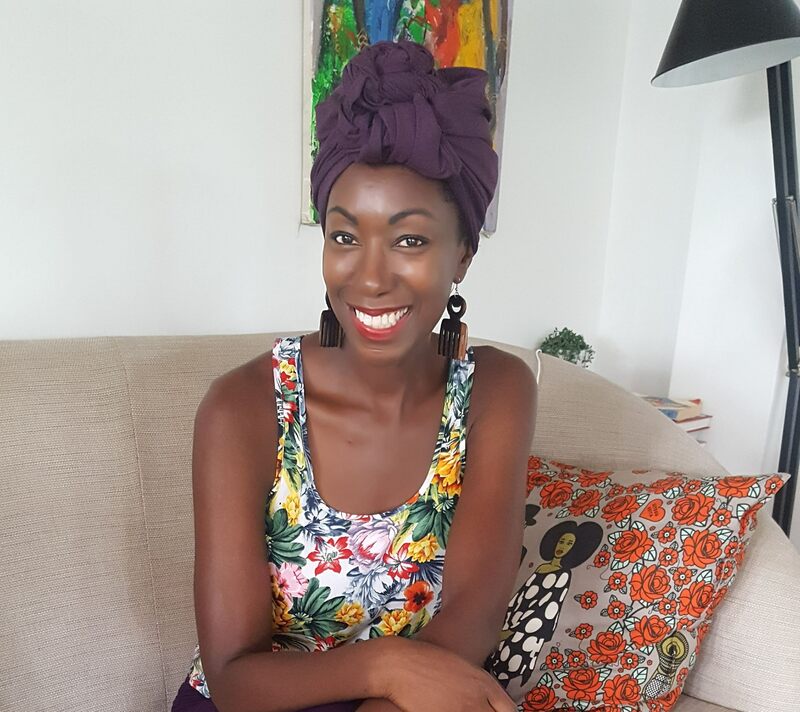 I would love to see her continue to use various patterns in her work while showcasing the beauty and richness of African fabrics at the forefront in the world of fashion. . I first saw this dress whilst flipping through my Flipboard magazine. I almost passed it and was like ‘whoa!’ isn’t that African print? Giving me ideas!